OPC Server to connect to LON networks, with built-in web server features. OPC Server LON to manage different LON project on the same PC! OPC Server and Web Server for Lonwork networks. 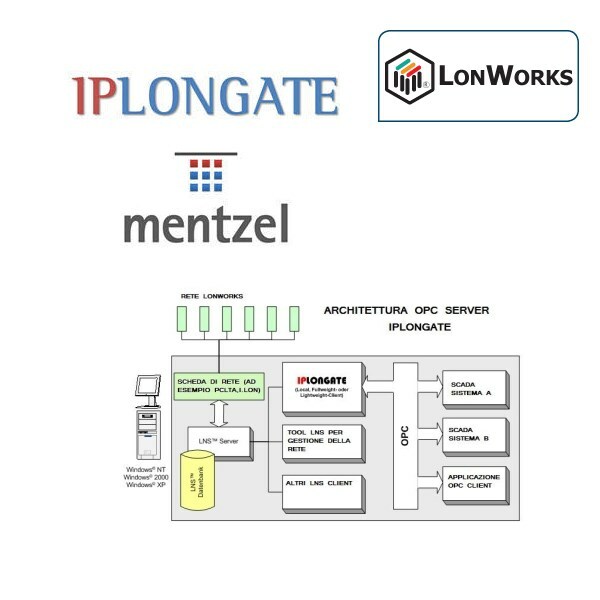 IPLONGATE is one of the more powerful and fast OPC Server for Lonworks networks based on LNS2/3. It is possible to use IPLONGATE with every SCADA package or with dedicated software using OPC interface. In short time it is possible to integrate LNS database in your project. A serie of built-in tools gives you the possibility to view, configure and manage your routers, nodes and SNVT on network. Communication with the application based on TCP / IP could be done in the following ways: OPC or through the 'Integrated web server. Tools for performance analysis and traffic allow you to view all the activity on the network (LON TCP) directly from the OPC Server. Towards the LON network IPLONGATE allows you to use any compatible interface LNS (eg iLON100 or PCLTA21) and to view and write all SVNTs of your application. A dynamic table usage can be set with a few clicks of the mouse. It can run on the same machine up to 20 different instances of the OPC Server, this means the ability to integrate with 20 different databases LON. IPLONGATE is currently in use in the major application Echelon in Europe. The project "Cœur Défense" uses 22 IPLONGATE servers connected to 23000 nodes Echelon. In Italy there are a number of applications made​​, such as the Ospedale S. Camillo at the Lido of Venice, Venice Apartment engineering Tecnomare, New Markets General of Verona, Ferrara police station. Marcom is able to provide all the support during installation, commissioning and optimization of the use of this application. It's available LON OPC Server manual in Italian and on request to the Italian version of the product. Available in several licenses based on the number of Network Variables. Download the demo version, allows the testing of the product directly on a period of up to 8 hours.